There were a lot of pay phones in Los Angeles, at least in the part of town we were in. 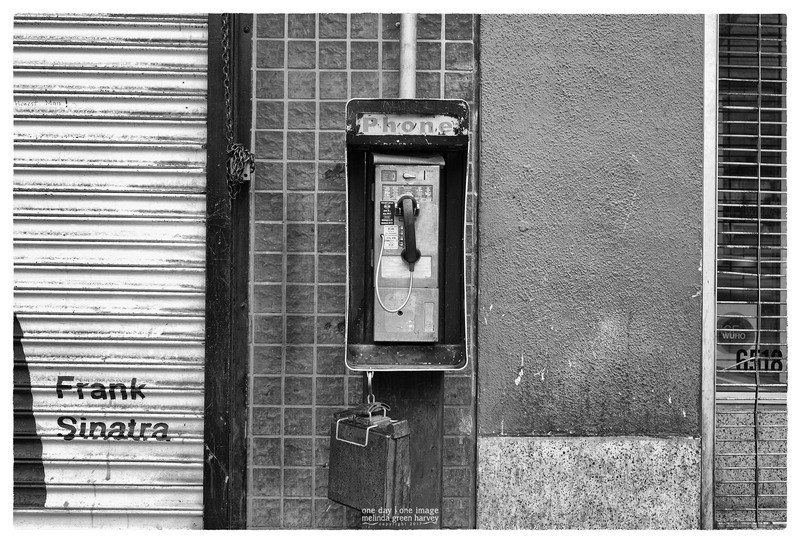 So, if you want to use a pay phone, for nostalgia or other reasons, LA’d be the place to go. This one, for some reason, seems to be closely connected to Frank Sinatra, although he was not using it at the time I walked past. Posted on March 5, 2017, in Photography and tagged 365 photo project, black and white photography, grand central market los angeles, learning to see, Leica, los angeles, los angeles california, melinda green harvey, monochrome, one day one image, photo a day, photography, postaday, thoughtful seeing. Bookmark the permalink. 18 Comments. Good find. Bad timing I guess if you were looking for Frank. Yes, but great timing had I needed a pay phone. Such an interesting intersection of things from the past—and yet another wonderful collection of rectangles. No matter where I go or what my subjects are, I always seem to get the rectangles involved in the image! Do you think there might be a phone book hanging in that case? And if so, what year (or decade) might it be from? Not that I would be in a hurry to look, in that part of town. See, I regret not checking to see if there was a phone book. We could have looked up numbers and made some prank calls! Or – and this may be a better idea – found out the answer and kept walking. I think there could have been something really creepy in that container. A pack of rats for instance. Or come to think of it, an effigy of Sammy Davis Jr. Pack of rats just comes naturally. Perhaps because I was digging in the compost (aka rat’s nest) the other day. Or perhaps because I am old enough for that to be an immediate association (reaches for his bifocals and cane). Wait. What are you saying about bifocals and canes? Should I take it personally? Well, it wasn’t intended that way, but we ARE the same age. I didn’t notice you with canes or bifocals in LA. I’ve got progressives. And computer glasses. And (soon)(probably)(the way it’s trending) some sort of seeing-eye animal companion. The complexities of seeing – mine trifocals are progressives with computer distance in the middle. Your seeing-eye companion is the one without a red dot. The complexities of seeing – mine trifocals are progressives with computer distance in the middle. Or come to think of it, an effigy of Sammy Davis Jr.
Well, mine are trifocals, so … Or come to think of it, an effigy of Sammy Davis Jr.